Datasly is a feature-rich data visualisation tool allowing to view, manipulate, and search data easily, among many others. Datasly is a light-weight and powerful data visualization tool for SAS®, CSV, Excel® data formats. With ClinViewer, you can easily filter, search, group, re-order, export to Excel, plot, compute statistics on your data tables, and more! 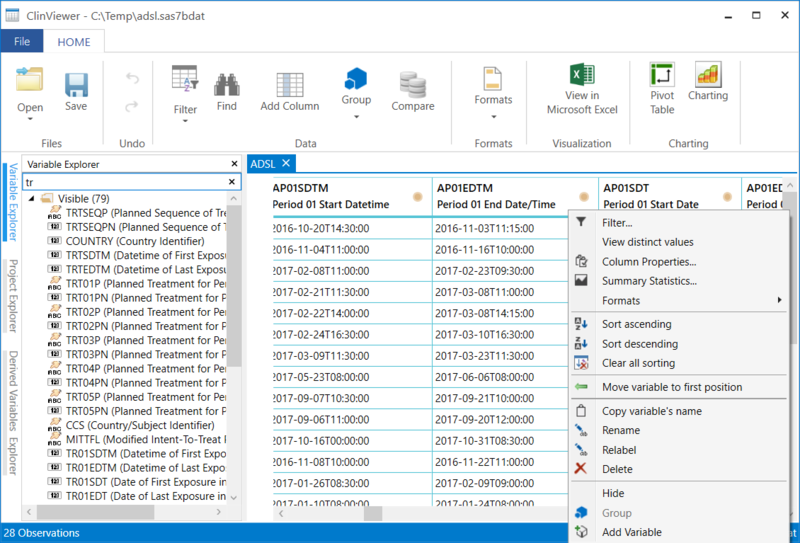 The dataset is displayed in an enhanced data table to the right side of the form where the user can reorganise and filter columns, view summary statistics on any column, or rename, relabel, delete, and hide any column. Certain observations can also be flagged or highlighted. On the left, the list of variables can be filtered, re-ordered, etc. Data can be filtered in using various methods such as using the SQL editor to construct SQL queries. Data can also be directly filtered in the dataset view by checking/unchecking values from a distinct value list in the column header, or by right clicking a specific value and choosing to keep or exclude it. Statistics can be calculated on specific variables very easily. 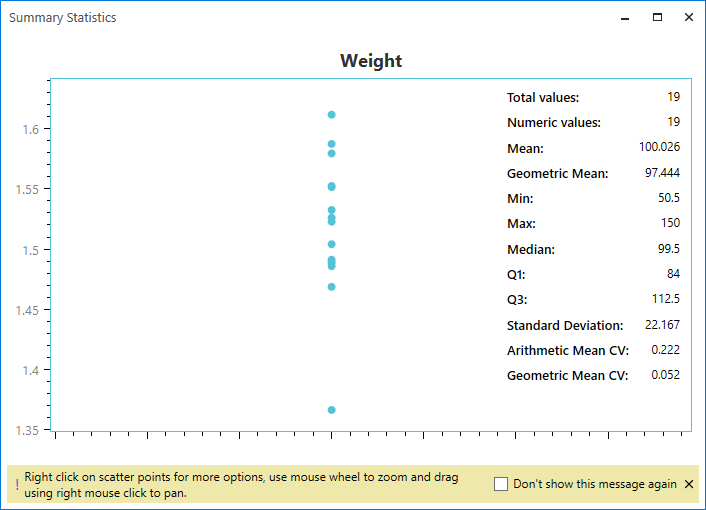 The mean, median, min, max, standard deviation,geometric mean, Q1, Q3, arithmetic mean CV, and geometric mean CV can be calculated, with the variable values plotted as points on a same vertical axis to easily spot outliers. Pivot tables can also be created to compute statistics grouped by specific variables. You can easily view the distinct values of a variable and the corresponding number of observations. Additional variables can be added by drag-and-drop. This will perform a multiple “select distinct ” SQL operation. Various chart types such as boxplot, line,bar, scatter, pie, bubble, and area charts can be generated be dragging variables from the data grid to the X and Y-axis of the charting window. Furthermore, multiple series can be be plotted by dragging more than one variable to the Y-axis. 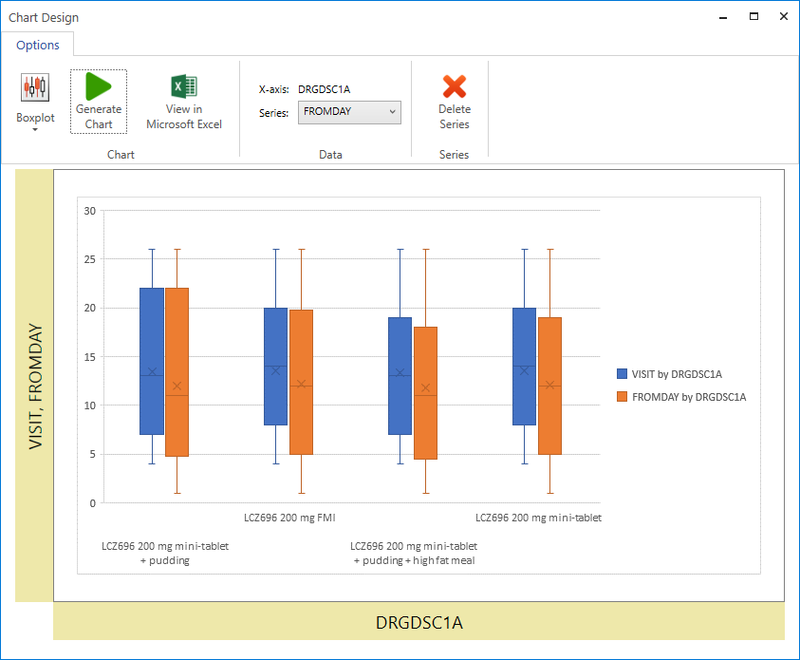 The plots can be saved, shared and edited within Microsoft Excel. 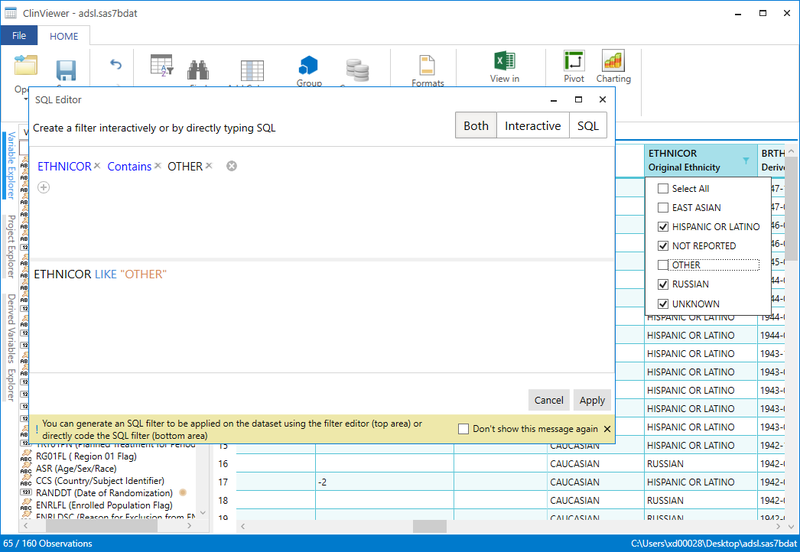 Data can be filtered using various methods such as using the SQL editor to construct SQL queries. 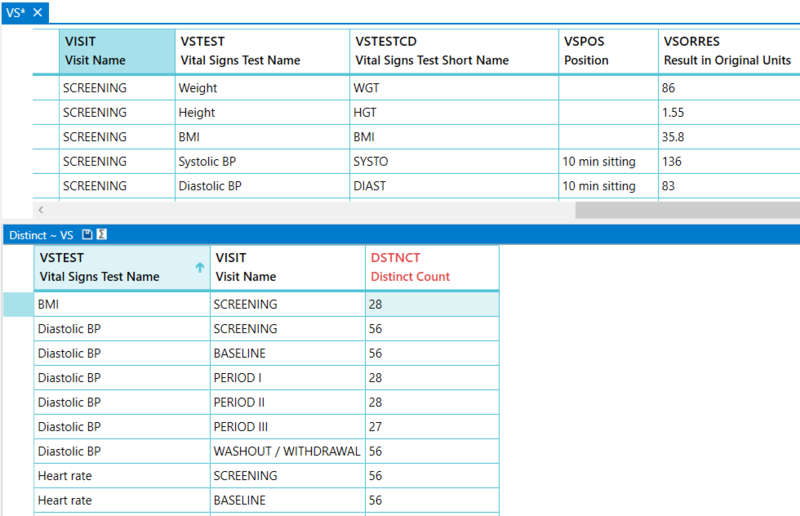 Data can also be directly filtered in the dataset view by checking/unchecking values from a distinct value list in the column header, or by right clicking a specific value and choosing to keep or exclude it. Datasly can be installed on Microsoft Windows 7/8/10 operating system and doesn’t need administrative rights during installation. A portable version is also available. Datasly can be set as default program to open .xpt and .sas7bdat files. SAS® is not required to be installed on the computer. The Microsoft .NET Framework 4.0 is required and will be installed automatically if it is not already installed on the computer. Feel free to contact us if you are interested by this product!